Understanding the outcomes for the stakeholders in your organisation or service, and how this might create longer term beneficial impacts is the main purpose of using an Outcomes Star. But Outcomes Stars can also be used as part of a framework which helps your organisation better manage the outcomes and impact that it makes. Social Accounting and Audit allows a third sector organisation or community business to build on existing monitoring, documentation and reporting systems to develop a process to account fully for social, environmental and economic impacts, report on performance and draw up action plans to improve on that performance. Through this process an organisation can understand its impact on the surrounding community and build a role as a catalyst for local benefit. Widely used across the social economy, social accounting builds from use of tools like the Outcomes Star to really embed social benefit into your organisation. The framework is built around 4 steps, as shown in the diagram opposite. 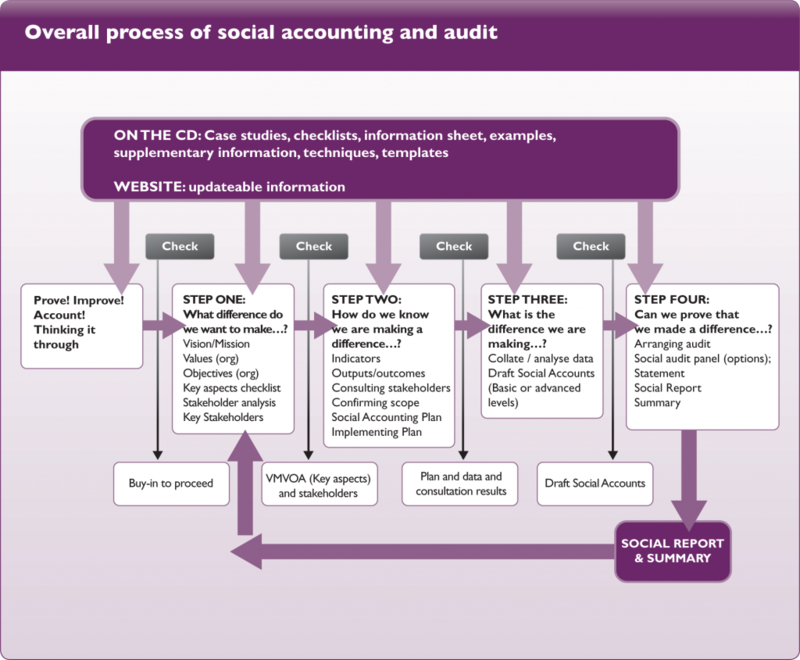 Organisations produce social accounts and social impact reports using this process. For more information about social accounting, please contact the Social Audit Network (SAN), which is a not-for-profit organisation that facilitates the exchange of information and experience between practitioners of social accounting and audit in the social economy, community and voluntary sectors. SAN was incorporated in 2003 by members of a national network of co-operative, social business and community development practitioners which had existed since the mid 1990s in the UK.